As we move deep into holiday season, our attention will soon turn to SXSW 2014. SXSW continues to grow each year as more tech companies, bands and personalities try to make their mark and get involved with the festival. As a result, SXSW has turned into a marketer's dream and a prime opportunity to bend the eyes and ears of festival attendees. That's where we come in. 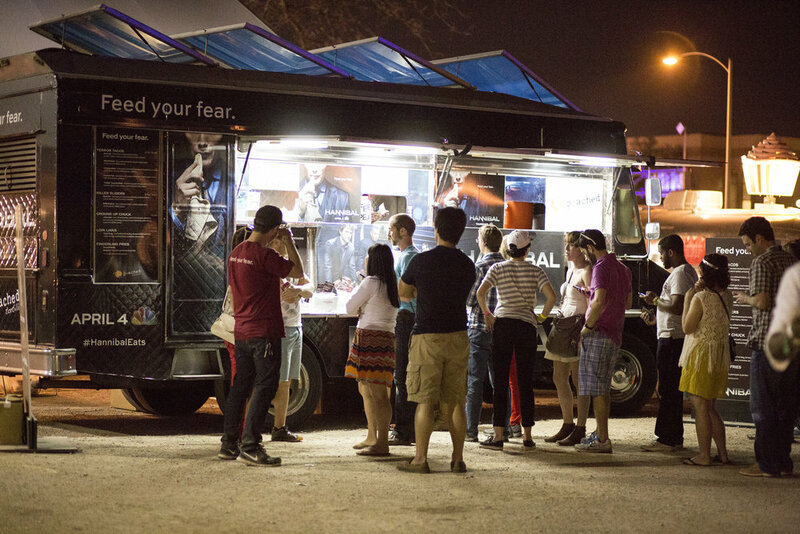 Having participated in SXSW for the past three years, we have witnessed the significant benefit of brand activations through the medium of a food truck. In 2012 we partnered with Cricket to promote their Muve Music platform. In doing so, we cobranded our truck with a full re-wrap and gave away over 3,000 tacos to SXSW Music fans as part of the activation. We pushed numerous tweets and facebook posts to make sure that our partner was getting the most out of the activation. Also in 2012, we worked with the NBC Today Show to activate two trucks with a special "Today Show" menu that served breakfast and late night eats. In both of these activations, there was a focus on food, catering, branding and social media presence. Most recently, in 2013, we partnered with NBC Hannibal to promote the upcoming debut of the new show. Using our menu as a base, we rebranded one of our trucks and served over 5,000 people in a span of ten days. Using the hashtag #hannibaleats, we participated in a social media contest where any customer tweeting a photo of their food with the hashtag would have a chance to win $10,000. NBC saw a bevy of tweets using the hashtag, raising the presence of the show during SXSW. In short, we are a one stop shop for your SXSW activation needs. Using our trucks as a platform, we can offer a unique branding opportunity coupled with years of experience in catering and food production. Additionally, we have vetted different social media activations using food as the medium to understand what can drive traffic and raise awareness for your brand and product. For more information on how to activate during SXSW, you can email us at catering@thepeachedtortilla.com or call us at 512.222.8781.